Only available from Laredo Performair, lightweight, breathable and washable. They are soooo comfortable. Wear, Wash, Repeat. 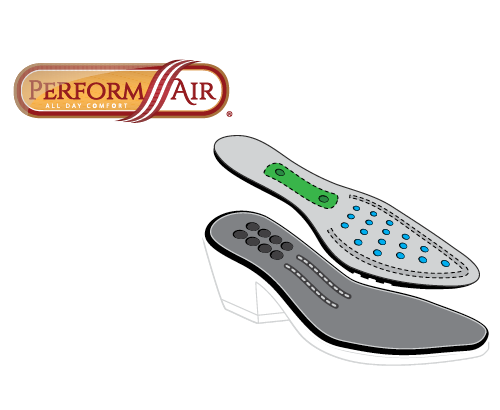 Insole: Polyurethane (PU) material adds flexibility while a built-in steel shank provides support and stability.n Perforations provide breathable comfort all day, shank adds support and stability, and the ribbing offers ultimate flexibility. Outsole and Heel: Goodyear welt construction of the outsole paired with lightweight, high-abrasion PU material allow for lasting durability and flexibility. The weight relief cavities allow for a light-weight, comfortable heel strike and the stitching provides flexibility, comfort, and security.